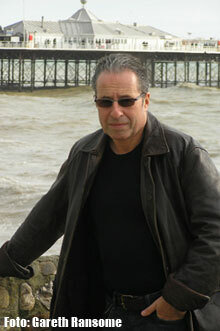 Peter James, welcome to The Crime House! If you were to describe yourself in only three words, which would they be? From film producer to crime author – how did that happen? I have alternated throughout my career to date between writing and producing film and television and writing novels. But now I am so busy with the wonderful global success of the Roy Grace series that I have no time for anything else. And actually, my heart has always been in writing novels more than anything else: The problem with film (and tv) is that it is a collaborative business and the creative process almost always end up being compromised because just too many people have an influence. For example you have the screenwriter, and very often a second screen writer or “polisher”, the producer – sometimes two or even more. The executive producers, again sometimes two or more. The director. The principal actors. The director of photography. The set designer. The editor. The composer. The distributor. Each and everyone of these has influence on the end product. With a book the creative process is utterly pure. There is just myself and my agent and my editor. If I don’t want to change one single word I have written I don’t have to. I love that freedom from the “committee” process of film making. Which one of your films are you most proud of? I am fascinated by human nature, why we do the things that we do and I think the best way to observe the world is through the eyes of the police. During a career in the police force the average officer will see almost every facet of the human condition – from violence to tragedy to comedy. From wealth to poverty. From good people to totally evil people. In addition I find the whole criminal world fascinating. There is no question in my mind that the police are the glue that hold civilised life together. Grace, the problem solver in your books, is there a real person behind his character? Roy Grace was inspired by a real life police officer, Dave Gaylor. The first time I met him was 15 years ago, when he was a Detective Inspector in Brighton. I went into this office and the floor was covered in piles of blue and green crates crammed with manila folders. I asked him if he was moving and he replied, deadpan, “No, these are my dead friends.” I thought, great, I’ve just met the only weirdo in Sussex CID!!! He then went on to explain that he just been put in charge of reopening unsolved cases – what we now call Cold Cases – for Sussex Police. He said that each crate contained the principal case files of an unsolved homicide. Then he said something that made a big impact on me: ‘I am the last chance the victims have of justice, and the last chance the families have for closure.” I thought these were incredibly human words, and when my publishers asked me some years ago if I would like to create a new detective character, I immediately remembered this. The great thing is that Dave Gaylor, who rose to the rank of Detective Chief Superintendent, knows he is the career model (but not physical model) for Roy Grace and loves it! He and I have become very close friends over the years, he reads each book as I go along, normally in 150 page chunks and we talk through all aspects of the police activity in the story and who in the Force it would benefit me to talk to and we travel overseas to police conferences together and to meet other police contacts of Dave around the world – most recently to New York, and to the International War Crimes Tribunal at The Hague. How do you feel about crime novels for children? Many of the novels I read as a child were “crime” novels. Enid Blyton’s “Famous Five” for instance. In many of the Richman Crompton’s Just William books, which I loved, they caught bad people. I think that the big lesson the crime novel can teach us is that life is not all black and white. There are not plain “good people” and “bad people”. There are plenty of good people who do bad things – and bad people who do extraordinary good things. Do you feel there is a serious risk people will stop reading physical books in favour of for example listening to the Audio versions? Your first novel about Grace, Dead simple, immediately hit the top lists. Describe the feeling! It is a wonderful, but very strange feeling. Writing is a lonely occupation and yet, through email, I get contact daily from numerous readers around the world and I love hearing from them what they like and, sometimes, dislike. I am immensely flattered that my stories are being read and mean so much to so many people, yet I’m nervous of upsetting or disappointing them. Your novels have been sold to many other countries, which must be wonderful. However, this means that a translator has been involved. Does it worry you that the translator doesn’t capture exactly what you want to say? It is incredibly important to have a good translator, but apart from France, where I speak the language, I I have little way of gauging. So far I have been very fortunate with the amazing translators who work on my books in 33 languages and my various publishers around the world. Occasionally it does happen that the exact feeling doesn’t quite come through in translation and a reader will pick up on this which gives us the chance to correct it in any future publications. If you were to buy a novel and it was available in both original language and a translation, which version would you get? If my language skills were greater, I would always choose to read a book in its original language! What I find many of my readers to, is to buy both versions. For instance I have a number of Swedish fans who buy the book in Swedish translation and the original English. First they read the Swedish version, to be 100% confident of getting all the story, then they read the English version to hear the author’s original “voice”. You have won a number of awards – which one would be the most prestigious? To receive this was quite amazing – particularly as I virtually got thrown out of school on my ear for only getting grade “e” in each of my three A levels – the lowest possible grades… I feel I am living proof of Oscar Wild’s wonderful remark: ”Nothing that is worth knowing can be taught.” !!!! When you don’t spend your time writing thrilling novels, what is your favourite pass time? Stephen King once said it is essential for an author as much of his time reading, as he is writing. What do you read at the moment? What Scandinavian crime writers are you familiar with, and do you have a favourite? I fell in love with the films of Ingmar Bergman when I was a student. Few movies have ever haunted me as much as his Seventh Seal. So I would have to say my all time greatest Scandinavian writer was a screenwriter (and director) rather than novelist. But of the current generation I think Camilla Lackberg is really brilliant. If you were to point me in the direction of another crime writer to present to our readers at The Crime House – who would this be, and why? I’ve always loved the crime novel gentre. Since I was a child I’ve been addicted to Conan Doyle, Agatha Christie, John D Macdonald, Elmore Leonard, Ed McBain, Ian Rankin – to name just a few. But of the as yet younger generation coming up, from the UK, I think Brian McGillivray, a Northern Ireland crime writer has an authentic voice and sense of place, and is well worth reading. to us. We await your new novel in Swedish/Norwegian/Danish/Finnish with enthusiasm! Nice interview! I will definately try out his books now! Peters books are very realistic, I work for Sussex Police and he has the ability to cut to the core of the investigation giving out detail without getting tedious, I highly recommend his works and the Roy Grace series is fantastic!